TRANSCENDENCE sounded like an interesting movie. It wasn’t received well, per se, in theaters and it didn’t hit the public like a ball of fire. Because of that, I sort of forgot about it. It dropped on HBO unceremoniously and I almost missed it. But, again, I come back to it being a movie which sounded interesting. So, I did what I do… I watched it. I watched TRANSCENDENCE (2014) on 7.3.15. It was my first viewing of the film. Calling TRANSCENDENCE a Johnny Depp movie is disingenuous. While he may play the character central to the film’s action, this is much more a Rebecca Hall movie. It is her character which proves important, and who’s story we care about. TRANSCENDENCE opens with a scene where we meet Max (Paul Bettany) five years in the future. Everything is run down, computers are literally door stops. We flash back to the present and learn that this is to be the story of computer programmers trying to make the most perfect artificial intelligence. That first scene, we fear, might serve to ruin much of the plot of the film. Turns out, unfortunately, that it does. Because we know the destination of this world, the journey, then, feels preordained with nary a big twist to make us feel like that first scene was worth learning. How different an experience would this movie be without it? How much longer would we be rooting for certain characters and against others? It is hard to say. The plot of this movie involves Will Caster (Depp) considering the possibility of AI. As bad luck would have it, a terrorist organization led by Bree (Kate Mara) takes all their aggression out on groups working in that field. Caster begins to die slowly, and his wife (Hall) and partner, Max, begin to consider alternative modes of survival. After uploading his consciousness to a computer, things get really weird. This is a movie which deals smartly with the issues of connectivity, networking, and artificial intelligence. People become avatars or powerless vessels. The military somehow becomes the hero against an individual villain. 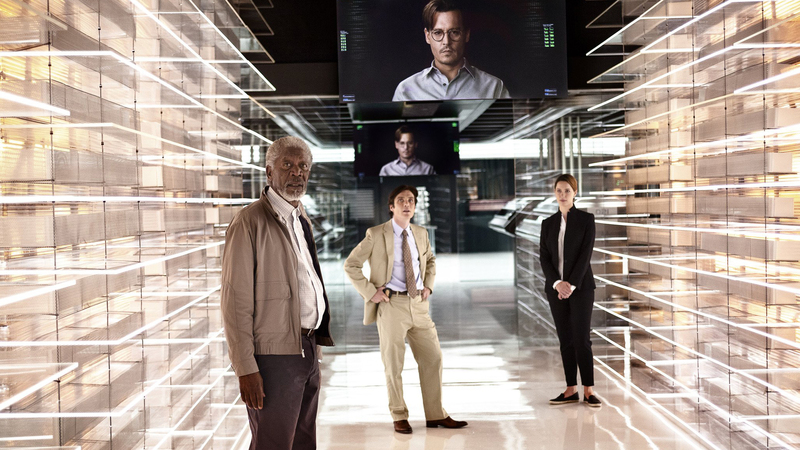 TRANSCENDENCE is an odd movie in that way, as our heroes become less so at the expense of those who first seem villainous even as (in a major flaw of the script) those wronged early on NEVER confront those who did them wrong. And so, this is a movie better in concept than it is in its scripted form. The script, penned by Jack Paglen, can not live up to the Director (Wally Pfizer – longtime Chris Nolan collaborator), the cast, or the themes. This is, then, a movie worth seeing but one that is not as good as it might have been. ~ by johnlink00 on July 5, 2015.